I am a teacher of English as a foreign language. I really enjoy teaching English from home because it is a stress free environment which is ideal for learning, and I can tailor lessons to meet the specific needs of my students. I find home stay teaching an intense and rewarding experience. I like to make my students feel comfortable and relaxed so they have the best opportunity to learn. I have taught English in France and the UK since 2009. Before I became an English teacher I worked as an environmental professional for 17 years for a number of large UK companies. I have the CELTA certificate to teach English as a foreign language and have a degree in environmental sciences. I have various environmental qualifications and also a postgraduate diploma in management studies. My husband, Bill, works in banking. 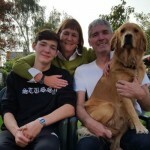 He is a very keen skier, and also likes cycling, playing golf and badminton. Our son, Tristan, attends a local college and is a very keen and dedicated rower. He rows for a local club on the nearby River Thames. Our recent addition to the family is Milo, a golden retriever dog. I walk daily in our beautiful Richmond Park with our dog Milo. I am a volunteer for an organisation in Richmond Park and another local charity and help out when I can. I also attend yoga classes. 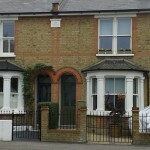 Our house is a typical English semi-detached Victorian house (built in 1903) in a quiet street. 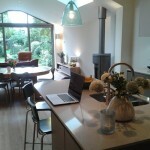 Recently renovated, it has modern and comfortable features including wifi through out the house. 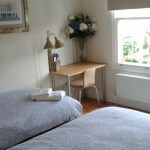 We have a sunny guest bedroom with two single beds, plenty of storage and a desk. The bathroom is on the same floor and has a bath with shower. 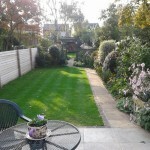 We have a lovely secluded sunny garden. Kingston is an historic busy market town with a lot of shops, restaurants, pubs and cafés. It also has a leisure complex with a 14 screen cinema and bowling alley. It is a 10-minute walk from our house to the centre of Kingston. Central London is only 25 minutes away by a direct train line from our local train station Norbiton (10 minutes walk away) to London Waterloo station. There are many interesting places to visit locally such as Hampton Court Palace, Kew Gardens, Wisley gardens, and Windsor Castle. 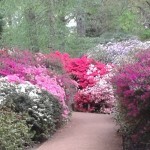 Royal Botanic Gardens Kew – Kew Gardens is a historic and magnificent World Heritage Site covering 300 acres. (http://www.kew.org)The gardens include some large and beautiful glasshouses with exotic plants from all round the world, two galleries of botanical art, a Treetop Walkway 18metres up in the air, royal Kew Palace (www.hrp.org.uk/kew-palace) and various tea rooms. It is only 30 minutes away by car or double decker bus. Visit to Central London – I’ll take you on an introductory tour of London by foot and by red double-decker buses, passing The London Eye, Westminster Bridge and the Palace of Westminster, 10 Downing Street, Horse Guard Parade, Trafalgar Square, Piccadilly, Leicester Square, Covent Garden, St Pauls, the Tower of London, Tower Bridge and walking along the south bank of the Thames to Waterloo (passing City Hall, HMS Belfast, The Shakespeare Globe theatre, Tate Modern, the Millennium bridge and the busy and bustling South Bank. We would go to Waterloo station by train, taking about 25 minutes, to start the tour. Hampton Court Palace – Hampton Court Palace is located close to Kingston and on the banks of the river Thames. It is most famous as one of our most infamous king’s – Henry VIII – favourite homes. It is a magnificent palace with the grand hall, tudor kitchens, a haunted gallery, a charming chapel, beautiful gardens and a maze, and so much much more. There are daily historical events with actors in costume. (www.hrp.org.uk) It takes 20 minutes by bus or in the summer we can go by a boat trip on the Thames (£6.10). The lessons were brilliant and we look forward to studying like this again. There were many breathtaking places which everybody should visit. We look forward to coming back again as it to vastly improve my child's English.